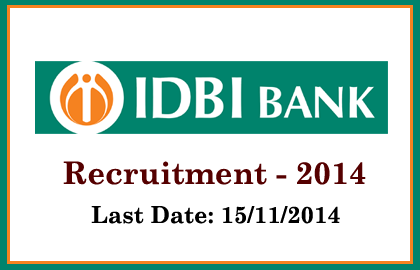 IDBI Bank has announced opening for the post of Security Officers in Grade B. Eligible candidates can apply on or before 15/11/2014. More details regarding this recruitment were mentioned below. Application Fees: Candidates should pay the application fees of Rs. 100/- (SC/PWD/Ex-servicemen) and Rs. 600/- (General& OBC) with postal charges. Payment can be made as cash in any of the IDBI branches. How to Apply: Eligible candidates can apply by filling the application form that you can download from the banks website:www.idbi.comor from the link that given below. Along with that filled application attach the bank’s copy of challan and attested copies of relevant certificates/documents, age proof, work experience, etc. Candidates should mention their valid email ID and Mobile Number. That application should be sent subscribing as “Application for the post of Security Officer-Grade B” to the address mentioned below. And also the filled application form can be deposited in the box that was specially kept at the reception counter of IDBI Bank Ltd, IDBI Tower, Ground Floor, WTC Complex, Cuffe Parade, Mumbai-400005. Application should reach on or before 15/11/2014.